links to articles providing more in-depth advice and information on the topic. There have been radical changes in the art market and models of how to sell art in recent years. Art is now sold via art fairs, online and in private transactions between collectors. Important things to know about those who represent you. artists who fill a gap in their portfolio - while being a good fit with other artists they already represent. artists people who know people who buy art - so that they can be introduced and add them to their mailing lists - and sell the art of the other artists they represent to them! "The art world is tough, the rules are a complete mystery and only the lucky few make money"
Facts first: 30% of all art galleries are loss-making. The art market is dominated by small- and medium-sized businesses who have historically been at the less tech savvy, more complacent end of the scale. fall short of good practice in the trustworthy stakes! ALWAYS (1) check them out first and (2) make sure you review/have a documented contract spelling out how your relationship works. terminate the relationship if they can't sell your work. a dealer may also aim to provide a service to art collectors by providing access to artwork they might want to buy. By getting to know their clients, a dealer can often introduce them to new artists and new artwork which the dealer thinks might well interest them. An art dealer may run an art gallery - but you don't have to have an art gallery to be an art dealer. Nor does owning an art gallery mean that somebody is an effective art dealer. Many art galleries have shut up shop on the high street to cut their fixed costs and now trade as dealers from non-gallery addresses. Their assets are the art collectors in their books and the artists they know. Their skill is in bringing them together. Art dealers might operate as a trade association for the purposes of promoting art and maintaining standards and the confidence of art collectors. An Art Gallery is physical space - a room (or rooms) for the display of works of art - and sale if the gallery is a commercial one. 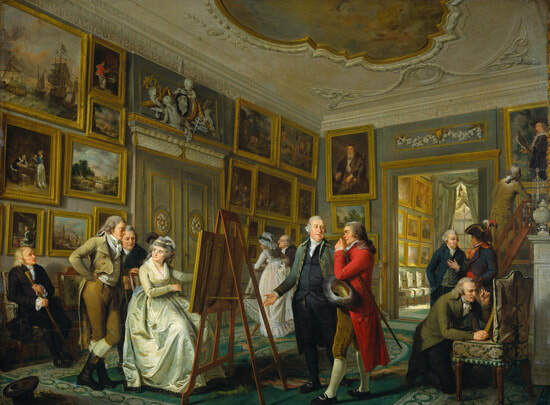 A Vanity Gallery is an art gallery that charges artists fees to exhibit their work and makes most of its money from artists rather than from sales to the public. A gallery owner is essentially an art dealer in a fixed location where he or she exhibits and sells art. Those who are successful know, understand and serve their art collector market well. An art gallery usually operates out of a proper building. If it's not in a good location, you need to work out which market sectors/art collectors they target and how they generate their visitors and business. It may or may not have a display window (some galleries dealing in high end fine art look like private houses and keep their artwork behind a locked front door!). They typically sell on a consignment basis (otherwise known as "sale or return". You must make sure you understand what the commission structure covers - and what it doesn't - before you sign with a gallery. An art gallery business might do a lot of its business and selling art via an Art Fair(s). This is because art fairs have become very popular with art collectors. Art Fairs make it very easy for art collectors to see a lot of art via a lot of galleries in a very short space of time. They are ideal for the time-poor art collector. Do bear in mind that too many art galleries in the past have been run by people who like art and artists but who were awful at business - which is why so many have gone out of business! ​Before being taken on by a gallery you must check out whether they know how to be business-like - or your art might end up behind the locked doors of a gallery which has gone out of business. An art gallery might put your art online. Don't use galleries to avoid selling your art online. The smart galleries have realised that a lot of people like browsing for art online - especially if it's below £10k - and make sure they make their art available to browse. the rate of galleries opening has fallen dramatically over the past decade..... new entrants face increasingly high barriers to entry. Resch's numbers are based on his anonymous electronic survey to 8,000 galleries. He got 1,300 responses (16%). These included information about their revenue, number of employees, and location. .......why do so few thrive? A simple economic analysis should make any potential gallerist pause to think; it is a textbook inefficient market, with too much supply meeting too little demand. But a further problem is found in the practices of the gallerists themselves; they have never changed their business model, relying on white walls, commissioned art, underpaid (or unpaid) interns, identikit opening events, 50/50 artist deals, and a presence at fairs. While art can be innovative, the business surrounding it is not. An insight into practices in top end art galleries from the man who created Larry's List - which provides a database of and an insight into top art collectors. This book SOLD OUT FAST when it was first published. His book analyses how the art markets and art galleries operate, the phases artists go through in terms of economic production and place in the art market - plus he also analyses the new breed of art collectors. He provides case studies to explain key points relating to how to market and sell art to high net worth individuals. ​You don't have to be a gallery to benefit from the lessons he offers. See a summary of some of the key points below - plus links to articles about his work below that. NEW BOOK in 2015 - SOLD OUT! Second edition now published! I ordered and waited and have been rewarded! However printing text in pink is beyond a joke! This is my summary of Resch's views about how galleries need to change to become effective. My view is that artists need to align themselves with art galleries that have contemporary business models for selling their art and who understand how to be cost effective and make profits. ​ A Three Tier Trading Structure - Successful galleries diversify their locations according to the life cycle stage reached by the artist. Garage: Young, emerging artists are shown in a very low-cost off-site location. Unlikely to be profitable. Essential to keep costs low. Gallery: More established artists are shown in a traditional gallery space. Overheads make this an expensive proposition; this level may also be unprofitable. The Gallery limits how many gallery artists it supports seriously and fosters as opposed to displays ad hoc in exhibitions. Fine Art: Living artists of genuine prominence and artists dealt with on the secondary market are represented in a private showroom eg a museum. Level at which profit can be maximised relative to costs incurred. The Collectors operating at this level are those who need to be introduced to the better emerging artists showing particular promise. The rationale behind the 50/50 split with emerging artists has never been about economics. What it costs most galleries to promote an unknown artist in a single solo exhibition, ongoing online and back-office presence, and a few art fairs, far exceeds the amount of money they will likely make from selling the average number of works at the emerging artist price points over the course of the first year or two. This is a salutary take of how the art market has worked over the last decade or so and how an intelligent art dealer, became a gallery owner and then closed the gallery and went back to dealing - and can write intelligently about art. So far as artists are concerned it's a reminder of why "getting a gallery" might not be the solution to you marketing your art. I first came across Edward Winkelman via his blog (which he no longer writes). He was providing some excellent advice for those artists who wanted to get a gallery - about how to approach a gallery (see links below). He opened (and closed) a gallery and now lists himself as the cofounder of the Moving Image art fair and has participated in art fairs such as ARCO, Art Chicago, Independent, PULSE, The Armory Show, and NADA. Below is a list of the blog posts written by the American gallerist and art blogger Edward Winkleman for artists who seek a relationship with an art gallery. Most of what he writes has universal applicability. The only caveat is he works in New York and not everything will be applicable to non-metropolitan situations in countries across the world. The blog became a book! This book is essentially written for people wanting to become gallery owners. Then he closed his gallery in 2014 - and went back to doing what he was doing originally. Selling contemporary art as an art dealer. In 2017 he published his new book. Art Galleries use words which not every artist is familiar with. Here are some of them - let me know which are the ones which have confused you in the past. confidentiality - the contract may require you to refrain from discussing its terms with anyone else. That means you must take advice on the terms before you sign it. exclusive - this means you are contracting to sell your artwork only through one dealer/gallery. This is unlikely to be the best option for you. However it's not unusual to strike an exclusive deal for a specific geographical area - you just need to make sure that the dealer/gallery can effectively represent you within this area and that it's not too big. Check also how you can end your contract before signing it. licence - this is permission you grant for the dealer/gallery to do a specific thing with your artwork for a defined period in a defined geographical area. The licence you grant should define very precisely what it covers. 12 Steps To Get Your Artwork Noticed by Galleries - Clint Watson - a former gallery owner - outlines all the different ways gallery owns can ignore your approach to them - and then goes on to list 12 different ways that should help you get a better response. This book is about selling art. It provides pragmatic advice clear actionable steps to help make you more successful in marketing your artwork to galleries. Gain insight into what a gallery owner is thinking as he or she reviews your portfolio. Understand why the most common approaches artists make to galleries are largely ineffective. Selling art in a gallery - what's the deal? Commission is charged by all commercial galleries. There's no standard rate as such. You'll find it varies by type of gallery and geography and often there is no rhyme nor reason for the variations. Commission is intended to recover the gallery overheads associated with having a building, staffing it and putting on exhibitions. Galleries vary as to what is and is not covered by the commission. If you intend to do business with or via a gallery, you must always check and get in writing precisely what their commission is intended to cover. Watch out for the gallery commission that is payable if a collector having seen your work in an exhibition then commissions you to produce a piece of art. Introducing artists to art collectors is the business the art gallery is in and many will seek to recover a percentage from you for so doing. These are links to pages of advice from ArtQuest about working with Commercial Galleries. They cover all the different aspects of having a contractual and legal relationship to sell your artwork via a gallery. Artquest: Contracts with Galleries - this article identifies the different kinds of contracts that an artist can have with a gallery. If exhibiting with a gallery you need to check whether or not their insurance covers your artwork. There's no hard and fast rule on this. It varies from gallery to gallery. The important thing is not to assume that they must be covering your art in the event of theft or a fire etc. This is a bible for both artists and art galleries who work on the basis of consignment by artist to art gallery! Tad Crawford is renowned for writing books which cover the legal and contractual side of the art business. This book provides a comprehensive coverage of the Standard Consignment Agreement including agency, consignment, warranties, transportation, insurance, pricing, gallery commissions, promotion, return of art, and more - PLUS the ways in which the law varies in different states in the USA. It also includes a ready-to-use contract. So where does that leave the middle class, those galleries in Chelsea and on the Lower East Side that have been around long enough to be somewhat established, but still have to sell enough to make rent? Now, they have to deal with a perfect storm of gallery-killing factors: a market cooling from top to bottom, plummeting prices for onetime hit artists who minted money for mid-tier galleries just two years ago, the chokehold of fair booth prices, skyrocketing rents in neighborhoods where buying a building is unthinkable. The sad fact is that changes in the past model of retailing is also changing the number of galleries around the world. Many are closing as more and more art is sold via art fairs and online. Major galleries are becoming bigger and more and more corporate. The middle class gallery is the one that is getting squeezed. Artists need to be aware of what can happen when a gallery closes - and how little notice they may get (if they get any at all). Sorry, We’re Closed: Dealers Explain the Grueling Process of Shutting Down an Art Gallery | Artnet News - So you want to close your gallery. What happens next? Artists move on - up or down the food chain. Galleries need to move them on - because they're not selling. An artist needs to become skilled at wanting to move on - and being moved on. Relationships sour and break down - and then end. ​It happens to everybody from the famous to those starting out on their art careers. Even with a consignment deal in place, things can still go wrong. When Yayoi Kusama left Gagosian Gallery in 2012, she asked for all her work to be returned to her within a month. It took nearly a year, according to a source close to the artist, because the gallery was trying to recoup its costs by selling as much of its [ Kusama ] stock as possible. The End of an Artist-Gallery Relationship, from Both Sides - Gallerist Edward Winkelman writes about what happens when it's time to call it a day. An overheated art market sets all kinds of things in motion. Big galleries with money to burn and multiple spaces to fill start circling smaller galleries, eyeing their most successful artists like the underdeveloped properties they sometimes are. What should you do when an art gallery doesn't want to work with you any longer? Rejection might seem like a downer of a way to start the Marketing Monday series, but the hope-dashing, nerve-breaking, thanks-but-no-thanks wall that stands between an artist and success is a looming constant. Rejection hurts. And it tends to stick with us for a long time - which is why some artists are a little fearful when it comes to showing their art. The Truth About Why Nobody Came to Your Art Show​ | ArtBiz Blog - The reason they didn’t come is because you assumed too much. ​The following are articles commenting on the book and/or his ideas and some are written by him. I see my relationships with artists as similar concentric circles. Gallery artists are core artists, those at the centre of the circle. We work together and communicate constantly, and I am at their service. Then there are others with whom I have a relationship, but do not represent. Some I show regularly. Then there are others that I might work with just once, or infrequently.